The lambda spaced lines on the wave peaks switch to valleys on the right. 1 - The half wavelength electron core. Distance: 12 wavelengths. Waves are adding to each other everywhere on the axis. Distance: 10.5 wavelengths. Waves are combining destructively everywhere on the axis. All the Huygens' wavelets are still in phase beyond the core. 2 - The full wavelength electron core. In July 2003, I found Milo Wolff's web site. I noticed that his electron had a full wavelength core. So I immediately wrote a computer program in order to check this. I found his diagrams very accurate and that the core's diameter should indeed be a full wavelength. They also indicated the correct amplitude in accordance with well known formulas. The Huygens' wavelets are no longer in phase beyond the core. The electron could be a nearly stable lossless system. Because Milo Wolff's electron has a larger core, the Huygens' wavelets are no longer in phase beyond the core. These out of phase wavelets should strongly indicate to any good optician that such an electron is a nearly lossless system. The wavelets' energy fades according to the square of the distance. Those coming from opposite points but going in the same direction do not carry the same energy when they meet. However, they then stay together forever and the difference decreases. The equilibrium point is almost reached for very long distances (millions of wavelengths). I must add here that an experience conducted in 2006 by Mr. Jocelyn Marcotte, using his own 3-D Virtual Aether algorithm, showed that this is not true for short distances. Anyway, the electron does not really need to be a lossless system because it is amplified by aether waves. Mr. Marcotte also showed that any spherical incoming Gaussian impulse simply reproduces the same normal distribution pattern in the center. Surprisingly, the well known two peaks "Ricker wavelet" (used for earthquakes, but not from "Richter") as a convergent spherical system produces the same normal distribution pattern in the center. 1 - The electron is a pulsating wave center. Electrons constantly radiate energy. 2 - The electron is a finite system. In my opinion its standing waves rapidly fade out and do not expand significantly outside a one meter radius sphere. 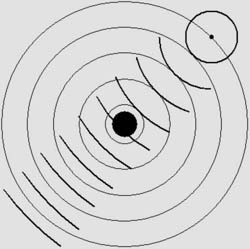 3 - Spherical standing waves are not made out of in-waves and out-waves. This is indeed a very useful (and effective) method for calculating standing waves. However, this point of view absolutely does not correspond to what is really going on. The medium (air or aether) simply moves back and forth inside a lambda / 2 space, and this phenomenon obeys Hooke's law. The electron's standing waves transform to regular traveling waves. The emitted energy is transferred from aether waves, hence the electron is a pulsating wave center. Waves cancel each other between two electrons. However, waves add themselves beyond the electrons. Waves add constructively to each other between two electrons. Waves cancel beyond the electrons. The central area between two electrons appears to be a gluonic field and its length may be hundreds of wavelengths (perhaps less). The standing waves' amplitude is doubled there. Because their energy is the square of the amplitude, this central area contains significant quantities of energy, which is mass. They are also amplified by aether waves in the same manner as electrons are, so that the final gluonic field mass is many times the electrons' mass. Most of the proton's mass, which is 1836 times the electron's mass, could be that of the gluonic fields (in my picture, the proton contains three quarks and a positron in the center, each quark being made of two electrons only). The correct electron wave amplitude. This is no longer true for very long distances. 3 - Milo Wolff's phase shift. Those calculations were very satisfactory and all seemed O.K. Such schemes can also be found on the Internet and could have been calculated by physicians a long time ago. However, Milo Wolff was the first one to propose it as an electron. The electron's –1/2 and +1/2 spins are opposite. The electron and positron phase is not opposite. 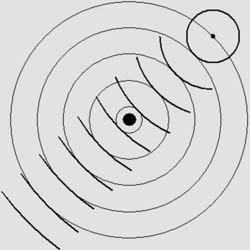 There is no need to invoke a phase shift in order to explain both spins. Such a phase shift seemed to me a quite useless and rather weird idea. However my computer programs could easily reveal the phases, so I begun investigating inside the electron's core and I found... a phase shift! Leftward and rightward waves adding themselves produce the standard electron. One could also say in-waves and out-waves, but both interpretations are wrong from my point of view. Clearly, the wave accelerates while it is inside the electron's central antinode. Since the beginning I always thought that the waves mean speed through aether could not change whether it was filled with high energy waves or not. For this reason the speed of light is a constant. It is absolute. On the other hand, it is well known that the speed of sound, for example, is faster at sea level then on the top of a high mountain. The waves are faster when the air pressure is higher, assuming that the temperature is the same. 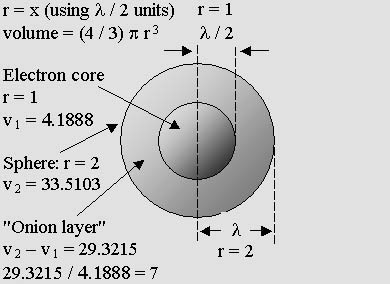 The first onion layer volume is worth exactly seven times that of the electron core. It turns out that this approach needs a rather complex (and useless) differential calculus. The sine wave energy distribution inside each layer should lead to the sin(x)/x equation. Clearly, while penetrating the electron's central antinode, the incoming waves have to deal with a different, seven times smaller volume. During half of a period, the aether's substance is highly compressed, so the wave should move faster there. Here, the Huygens' wavelets come from the surface of just one hemisphere, that on the left. All wavelets from both hemispheres simply reproduce Milo Wolff's electron. The above animations show that any hemispheric wave would move faster then the speed of light inside the electron's antinode. Such a situation may be seen as the result of millions of Huygens' wavelets coming from the inner surface of only one hemisphere. However, this does not occur inside a static, unmoving electron because both hemispheres add their waves in the opposite direction. Each spherical wave center of curvature stays at rest inside aether. The forward amplitude is 3 while it is 1 backward. The difference (3 – 1 = 2) indicates that the electron's core is constantly pushed forward by half of the speed of light. This is a very plausible explanation for inertia. Any moving electron cannot change its speed unless a change in forward or backward wave amplitude occurs. A tribute to Mr. Milo Wolff. So far as I know, Mr. Milo Wolff first proposed this spherical standing wave as the basic unit for matter. He told us that the electron and the positron were the same particle. He discovered the important lambda / 2 phase shift. He showed that the mass increase was related to the Doppler effect. He also demonstrated that while their central core is seen as a point, electrons are present inside a rather large space and can interact by the means of their waves. Electrons and positrons are not isolated. They can form a structure: a Wave Structure. Divergences are likely to slowly disappear. On the other hand I do not agree with Milo's many other ideas. Mrs. Caroline H. Thompson did not agree with them all, either. Because I usually agree with her and because so many coincidences cannot just be coincidences any more, I feel that we have found the Ariane's wire leading to the truth. I strongly believe that Lorentz was right. His Relativity is true and complete. Space and time are distinct and absolute. Einstein's Special Relativity seems to be true but it is not. The speed of light is not the same in all frames of reference. He also misled us for 100 years about photons and gravity. His ideas about space-time contraction and/or curvature are ridiculous. I also agree with Mr. Serge Cabala's ideas. The piston machine on his home page is very interesting. It shows how the Lorentz transformations act on matter. In my opinion this pioneer should be remembered as the first person on this planet who discovered (around 1970) that matter is purely made out of waves. He postulated that aether should exist, and he also showed that Relativity is consistent with aether. Mr. Yuri Ivanov discovered in 1990 that standing waves undergo a contraction according to Michelson's calculations. This is of the utmost importance. As far as I know, nobody else was aware of this before him. He showed that matter using standing waves as bonding forces should also contract for this reason explaining Relativity. However, he clearly did not understand well Lorentz's time equation, and he finally ended up with too severe a transformation. The electron phase shift is important. It leads to some totally different wave mechanics. Magnetic, electrostatic and gluonic fields are especially involved. Action and reaction must also be explained differently. This phenomenon could certainly be experimented inside water using a large number of loudspeakers placed on a sphere in order to produce wavelets in accordance with Huygens' Principle.